Born and raised in California, Annika moved to the upstate of South Carolina to attend Wofford College while playing Division I soccer and graduated with a Bachelors of Science degree in Psychology. Knowing she wanted to enter the medical field while also fueling her creative drive, Annika found Occupational Therapy and hasn’t looked back since. She went on to receive her Masters of Science degree in Occupational Therapy at the Medical University of South Carolina. During her time at MUSC, she was involved in global health research in Haiti and the Carolina Miracle League. 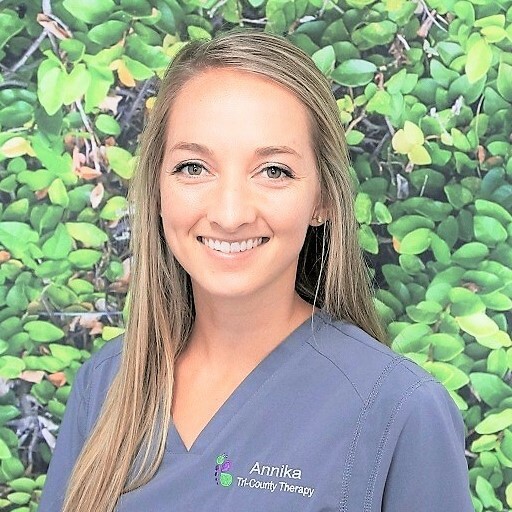 Annika is a member of the American Occupational Therapy Association (AOTA) and South Carolina Occupational Therapy Association (SCOTA). Providing client-centered, developmental therapy to children and their families in a fun and collaborative environment is what she is most passionate about! Although a Californian at heart, Annika has grown to absolutely love the Lowcountry and all it offers. She enjoys running, yoga, soccer, playing tennis, as well as spending time on the many waterways in the area with friends and family.